My Thunderbird is configured to connect via LAN to my college IMAP server. When a new mail arrives, there is only a system notification saying a new mail has arrived. The Messaging Indicator envelope does not turn blue. Neither does the Thunderbird icon in the Unity Launcher show unread mail count. So if I miss the notification because I was looking away, I do not have a way of knowing that a mail has arrived. I have tried purging the whole package including the ~/.thunderbird folder, but the problem refuses to go. Messaging menu works fine because Empathy and gm-notify both use it without any trouble. I seem to be experiencing the same problem with a POP account that's setup to use global folders (Edit -> Account settings -> [POP account name] -> Server Settings -> Advanced). Any incoming mail triggers a notification bubble but fails to change the color of the messaging menu icon. However, if I use a separate inbox for the account, then new messages do trigger the desired color change. I am experiencing this bug too, but I use pop3 for all my accounts instead of imap, and all of my accounts use the "inbox for this server's account". The envelope indicator icon does not change, nor does the unity icon show an unread count. Ubuntu 11.10, Thunderbird 8. I had mentioned IMAP because I remembered a similar bug in Evolution which affected only IMAP accounts. I had not checked POP here. Does work occasionally now...the unread mail count shows up all the times(does get stuck occasionally even if all mails are read), and the envelope goes blue once in a while, usually when the system is not in use. Seems to work fine after latest updates to 11.0~b1+build2-0ubuntu1. If you find that the envelope does not turn blue for all messages but only occasionally, this is probably not a bug but a feature, see Bug #957922 and #841116. Thunderbird now uses some algorithm to decide which (supposedly important) emails should turn the icon blue and which not, Since the user is not aware of this, the behavior may appear as random. This is possibly a duplicate of either #957922 or #841116. Nishant: could you please check if workaround mentioned in bug #841116 comment 7 fixes the problem for you? If this is the case this bug should be marked as a duplicate of bug #957922, which is in progress. 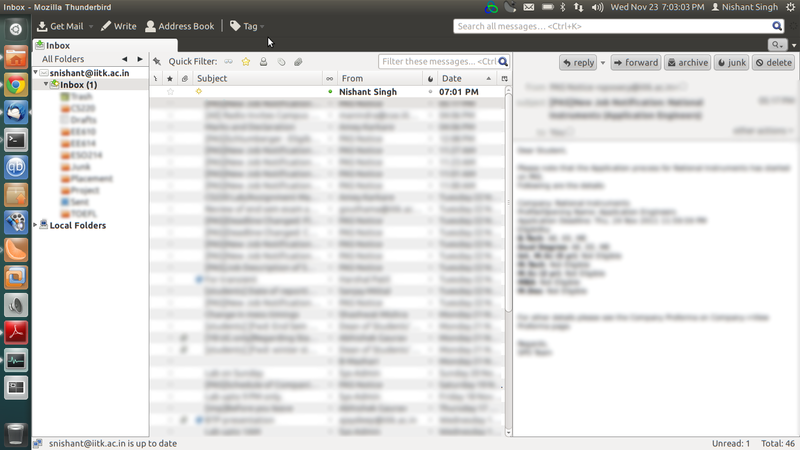 I have this issue in 17.0+build2-0ubuntu0.12.04.1, that is, I never have a persistent indicator that I have new mail. The workaround mentioned in bug #841116 comment 7 does not fix it. Same problem here. Gmail through IMAP. Never a blue envelope. This has not always been so, but has gone on for some months, maybe since upgrading to 12.10. I have now 12.10 with all the latest updates (including proposed), Thunderbird 17.0.2, and Messaging Menu and Unity Launcher Integration 1.3.1. I've read how the envelope colour filter is supposed to work, and I think that would be fine, but it's just not working that way. And I also don't get a launcher message count, which I assume I should always get (as I did before). I do get the popup notification. I have tried both settings for extensions.messagingmenu.inboxOnly without any change. I never get any notification from Thunderbird. I'm using GMail with Thunderbird 17(pre-installed with Ubuntu 12.04 LTS 64-bit). My Ubuntu updated to the lasted version. I expected to see notification when new e-mail arrived like when I'm on my phone. I think the problem is related to Thunderbird because I got notifications just fine with Empathy Chat. I don't get neither notifications nor the blue envelope. Using the ExQuilla Exchange addon for my mail.